4-Color Process (4CP): Price includes a free 4-color process imprint. See General Ordering Information tab for standard imprint colors. Full bleeds available. For art templates,click on templates above. 5 working days. 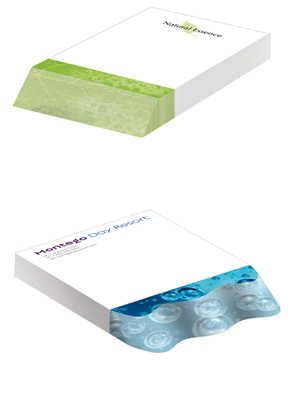 Add 3 additional working days for beveled notepad quantities of 1,000 pieces or more. For orders of 2,500 pieces or more, the factory will assign a ship date. Add 10 additional days for custom die cut beveled notepads, 500 piece minimum.